There’s a reason that any reputable sprinkler or lawn care company will recommend routine sprinkler blowouts for your sprinkler system: it saves you money and keeps your sprinkler system functioning at top shape for much longer. Hiring a professional sprinkler service company to perform regular sprinkler blowouts and winterization, you can avoid damage to your system’s pipes by buildup or leftover frozen water in the winter. And if you’ve experienced even the slightest crack in your sprinkler system, you know how important that can be. 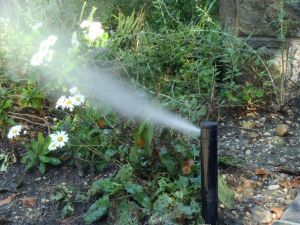 At Water Solutions Company, we have been performing sprinkler system blowouts and winterization for years. We are professionals who know the needs of multiple types of sprinkler and irrigation systems and know how to expertly provide this routine maintenance service with the level of precision you need to care for your sprinkler system. We use pressurized air to blow all the water from your sprinkler hoses and pipes and completely flush the system so that you can be assured there is no water left to freeze, expand, and crack your pipes once that Denver winter sets in. We know your time is precious and we can perform this sprinkler blowout in less than 20 minutes. This simple routine maintenance procedure can save you hundreds of dollars on what it would cost to replace pipes of a sprinkler system that is damaged due to debris buildup or cracking. Usually sprinkler blowouts are a simple services for professionals to provide, but the easy and quality of a professional sprinkler blowout comes from experience. Many people hire an amateurs or attempt to perform a sprinkler blowout themselves, which can lead to bigger problems and a potentially dangerous situation. Professionals have the necessary equipment to evacuate all water from your sprinkler system that an amateur procedure cannot guarantee. Even if a small amount of water trapped in a valve or pipe can expand enough during freezing weather to crack and damage your sprinkler system, and using high pressured air improperly through a sprinkler system can not only damage your system, but can also be dangerous. We are experienced and accessible. We understand all types of Denver area sprinklers and do our best to make sure that all your questions are answered by being readily available via phone or email. Simply put: We know Denver! We understand the climate and terrain of the Denver Metro Area and how to provide sprinkler blowouts and winterization based on the area. Call Water Solutions Company for a Denver sprinkler blowout quote today to give your sprinkler system the care it needs to last for years to come!